With every Joe Bloggs opening up ecommerce emporiums left, right and dead centre, it can be hard to stand out from the crowd if you're an online retailer. So how do you cut through the noise? With a good story, of course. Take a moment to stroll through the corridors of your youth. To your lamp-lit, childhood bedroom. Remember the stories you used to read, the pictures, the front covers? What a treasured little place those memories still reside. Stories have the power to envelop, connect and last. 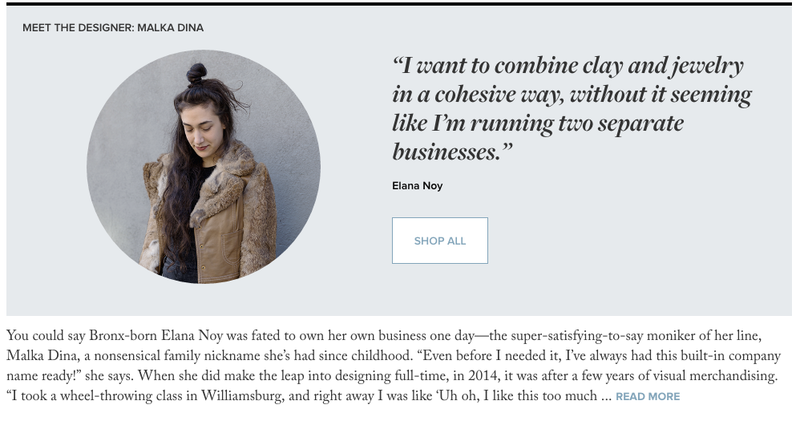 Some of the most successful ecommerce stores’ success has, in large, been thanks to their ability to strike emotional connections with their community, that live beyond the buy button. Of a Kind, the brainchild of American-based university friends, Claire Mazur and Erica Cerulo, sells the pieces and tells the stories of emerging fashion, home, and jewellery designers - and has become our new obsession. The company, born after a “frantic exchange of emails in 12 hours” was built to tell stories, and is (funnily enough) quite good at it. Let us show you why. Roots. Founders Claire and Erica talk about the evolution of their brand, as a simple idea based on the desire to tell the stories of the products they sell. This helps customers connect and understand. Promotes their proposition. Marketing, exposure and distribution for emerging fashion designers. Collaborating with designers on limited edition "one of a kind" collections. Big focus on sharing their values. These values resonate with their target market and reinforce their brand image. They sell an idea. Their story is about forging connections with the stories behind their products. That's a key differentiator. People connect with an experience or lifestyle much closer than just a product. *Disclaimer: we are actually obsessed, hence the creepy collage. Their "about us" section is full of direction and meaning. It makes you want to grab the closest person, have a deep and meaningful conversation (DMC) and start selling something, anything. Their passion and dedication to creating incredible products warms you to the brand. It's an extension of their story. They use Instagram to reflect their proposition, with a rich mix of content, including lifestyle posts, editorial snaps of their collections and the stories behind their creations. Blend of product and lifestyle. The mix of content helps to keep their followers engaged with the product offering, while peaking into the context of the brand. Sense of humour. Connecting with your audience beyond product and polished imagery is important. Sharing slices of your humour helps bring you closer to your customers, letting them connect with the personality behind the brand. It helps if you're actually funny. Getting to know the founders. Have you ever wondered what your browsing history says about you? Probably not. 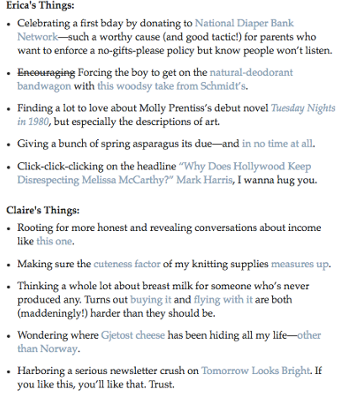 But Erica and Claire give us permission to delve into their world wide web of consciousness, as part of their email newsletter. Revealing what they're passionate about, the causes close to their hearts and what makes them laugh. Product soft-sell. Their diaries, which have a large cult following, don't shy away from a subtle soft-sell, both ladies casually intersperse products from the store throughout their diary, showcasing that their products are truly part of their story. Product story. Name the last time you bought something and knew who made it. That scratchy, uncomfortable feeling in your head is probably a metaphorical lump of tumbleweed. Of a Kind's M.O. is to tell this story, to bring the products they sell alive and connect the dots between creation and commerce. Multimedia. 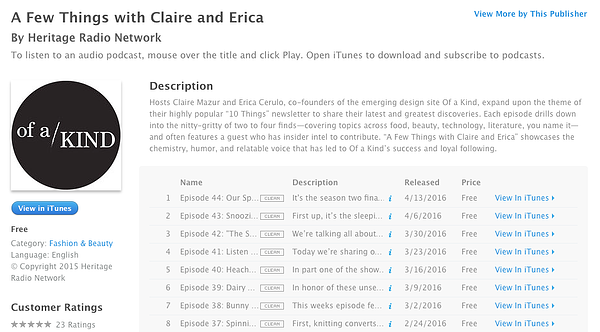 As if they weren't busy enough running a business or anything - the duo produce a popular podcast every week or so. Diversifying your offering and connecting with various channels makes your voice, story and brand more accessible. Lifestyle. 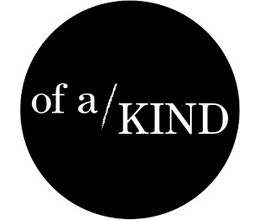 Each episode covers different topics across food, beauty, technology, literature, 'showcasing the chemistry, humour, and relatable voice that has led to Of a Kind’s success and loyal following'. Building a story with your passion, motivation and direction will help connect you to your customers. It's no easy feat. Get it wrong and your brand is damaged and you'll lose the market you're attempting to connect with. Get it right, however, and you'll become something more than just a logo and a shopping basket. You'll become part of people's lives. You'll matter. 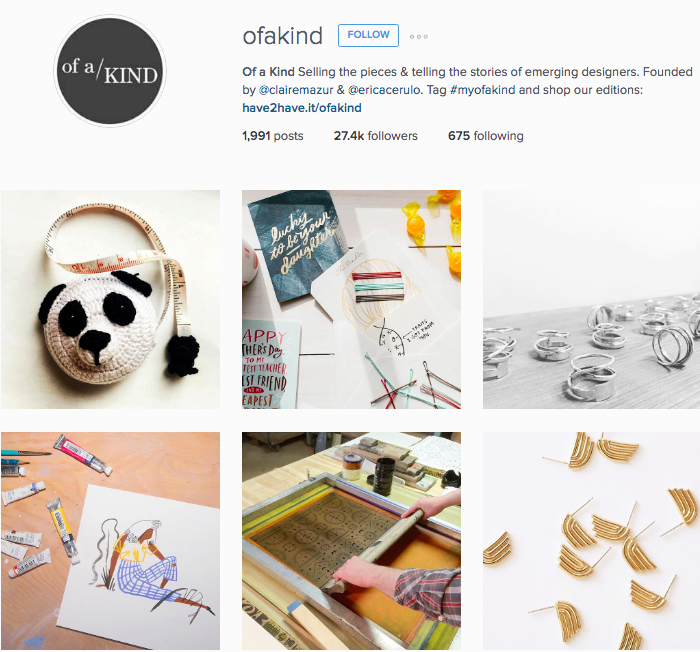 Of a Kind is a great example of how brand's should inject their story into the very fabric of their ecommerce offering. It helps give the brand a foundation, gives it life. Always focus on your inception, define your values, be excited about what you're selling (otherwise who will) and be authentic. People like a human touch. It's easy to understand.